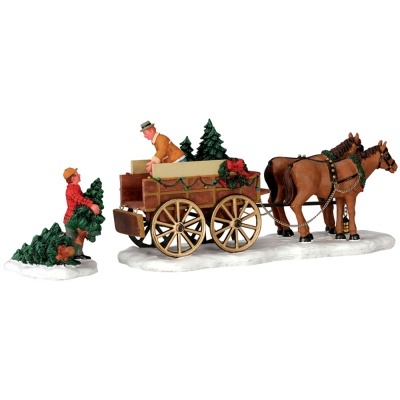 Lemax Christmas Tree Wagon depicts two happy gentlemen loading the next load of fresh-cut Christmas tree's onto a horse drawn cart heading to market. Lemax Christmas Tree Wagon is suitably placed in and amongst a seasonal Lemax village miniature Winter scene. A firm collectors favourite Lemax Vail Village themed collectable piece which joined the Lemax collection in 2004. Christmas Tree Wagon offers a delightful 2-piece hand painted polyresin set including multi figurines on two snowed bases to compliment your seasonal Lemax Christmas Village.